Taken from the book Tragidoodles by Ben Cameron (Unbound, £9.99). You can see more of Ben’s work on his website, doodlesbyben.com. 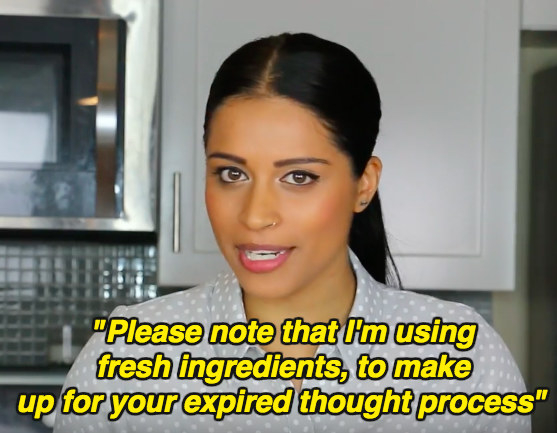 Lilly “Superwoman” Singh just admitted why she doesn’t address negative comments, in a video titled “How to Make a Sandwich”. It’s because she has two sides, and usually favours the first side. Butttt then she read out a comment that she gets pretty often. And well, decided to unleash her second side to answer the fine man’s question. …and every part of the process was riddled with uncontainable savagery. She didn’t hold back at all. And people LOVE Singh’s ball-busting, no-nonsense response to all the sexist commenters out there. 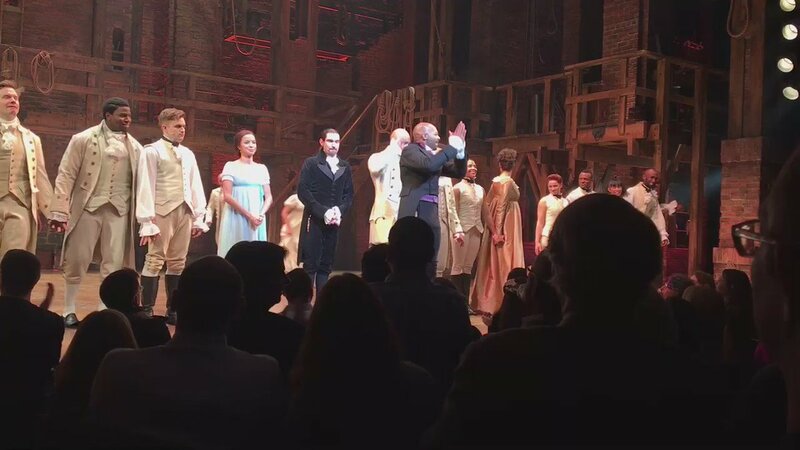 “We, sir — we are the diverse America who are alarmed and anxious that your new administration will not protect us,” said actor Brandon Victor Dixon, who plays Aaron Burr. It was unclear if Pence caught most of the statement. The Associated Press reported he ducked out before the address and Dixon, as he began, noted that the president-elect was already walking out. “I hope you will hear just a few more moments,” he said. 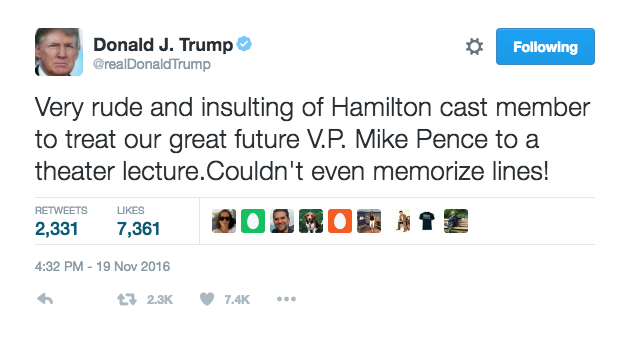 Hours later, Trump continued to tweet about the incident and called the cast “rude and insulting” although he deleted it minutes later. Some people in the audience also speculated that lyrics of the musical appeared to be sung directly at Pence, a question that seemed to be answered once the cast addressed Trump’s running mate at the end of the performance. The awkwardness didn’t stop there. 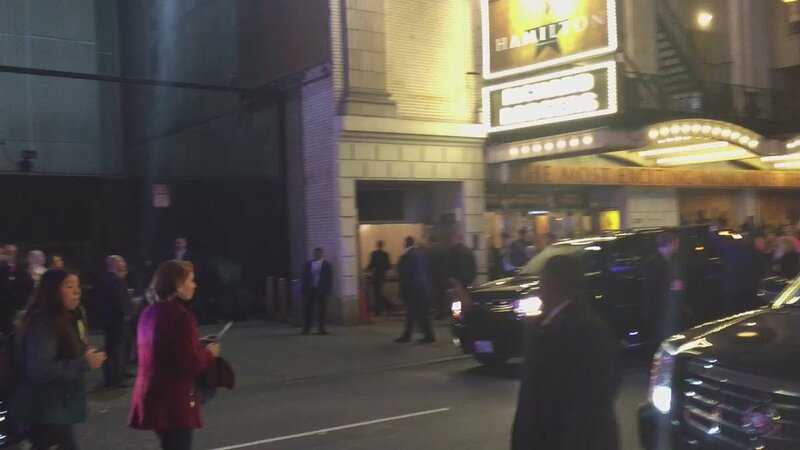 A Broadway show that focuses in significant part on Alexander Hamilton’s immigrant experience was an unexpected choice of entertainment for the conservative vice president-elect. In March 2015, Pence signed Indiana’s Religious Freedom Law, which opponents and businesses criticized as allowing discrimination against LGBT people. The outcry — which went national — led to a revision to protect against discrimination, which Pence also signed. Dixon’s statement might have struck a personal chord for the diverse cast, whose main character — previously played by Lin-Manuel Miranda — is now being played by Javier Muñoz, an HIV-positive, openly gay man from a Puerto Rican family. That was the year of the nationwide dumpster fire, we’ll tell our grandchildren one day. The year the Warriors blew a 3–1 lead in the finals. The year we lost David Bowie, Prince, and Vine. The year a man successfully campaigned on racism, misogyny, and anti-immigrant sentiment all the way to the highest office in the land. Things have felt confusing, scary, and downright dystopian in the two weeks since the election. Projections about the future make me feel like I’m living inside hastily written chapters from a rejected Margaret Atwood novel (“a little heavy-handed with the metaphors, don’t you think?”). There’s a whole lot of terrifying (and fake!) news out there. There’s been an alarming resurgence of hate crimes against people of various backgrounds, with no sign of slowing down anytime soon. With so much happening so fast, it’s hard for anyone to know what to do except lie in bed crying and making memes. But chances are, if you’re white and you’re feeling overwhelmed right now, the people of color in your life are dealing with even more compounded forms of stress and straight-up fear — and for good reason. When the news of Donald Trump winning the election first started to pour in, my phone became a life raft. Texts and calls and DMs and emails from other people of color rolled in urgently, each one bleeding into the next for days on end: “Are you alone? Are you okay? Are we okay? I love you. I saw this coming, but I’m scared. We will keep going. We have to keep going.” We held each other because we had to. Because we have to. Exhausted and overwhelmed, I didn’t have answers at first. I needed rest before I could respond. Before I could teach, before I could reach back into my experiences organizing on campus and beyond to do this newly urgent work. But now, two weeks and severalterrifying cabinet appointments later, I want to help teach them how to build us all a raft. Show them how to be the most helpful friends they can during these ominous times. So I pulled together this very nonexhaustive list of ways to help. We’ve entered a new storm, but lessons from the past can still guide us. Here’s a start. 1. Don’t ask your friends — or random internet acquaintances — of color to #process everything with you. Emotional labor is exhausting, and people of color are already carrying the burden of existing as targets in this openly hostile terrain. The last thing we are equipped to do under duress is take on the weight of your anxieties too. If your first temptation is to text a black friend about your own fear, you’re probably contributing to that load — even if it’s not intentional. Find other outlets to explore what you’re feeling. Reach out to other white people to have those conversations, write in a journal or blog, or talk to a mental health professional if you’re able to. People of color can’t be your de facto therapists whenever something scary happens, especially when we’re the ones directly in harm’s way. 2. If you want to reach out to your friends of color to ask about how they’re feeling, don’t force a conversation. Again, having emotionally fraught conversations can be draining. So if you want to check in on your friends or co-workers, send a simple but supportive message that doesn’t require them to respond back with a paragraph. I’ve found that messages like “I know you are probably dealing with a lot right now, but I just wanted you to know that I’m here if it’d help you to talk with someone” can mean the world. They convey your desire to be there — without putting the onus on the recipient to stop what they’re doing and engage you. Have you ever had a day when texting back or even getting out of bed feels like a task hard enough for the final level of a video game? We get those too. And in the coming years, as news and events continue to underscore just how much danger we’re in, there will probably be even more days like this. So don’t take it personally if a friend doesn’t immediately respond to your reaching out; sometimes the best way to support someone is to give them space. 3. Invest your energy into having difficult conversations with white people around you. Ask open-ended questions about race and stereotypes. Feel free to share how your own thought process has evolved and why; admit to not having all the answers. Be frank when someone says something fucked up. You have far more leverage with other white people than people of color do. 3a. Especially your family members! Holiday conversations can be especially difficult, but don’t avoid your “racist uncle” because it’s easier than challenging his views. Again, you have far more leverage with him than any person of color would. Avoiding difficult discussions about race is a luxury we don’t have. And if they aren’t getting it in your conversation, feel free to send this flowchart their way. If they insist on talking specifically about Trump, here are some conversation points you could try incorporating. 4. Amplify the work and words of the most marginalized people. People in power get cited as experts on marginalized people’s experiences because they’re considered “unbiased.” You can help push back against this faulty paradigm by insisting marginalized people are the experts on their own lives and the -isms that affect them. Get into the habit of sharing articles and essays and poetry and art by people of color. Buy their books. Link to them on Facebook or Twitter or Tumblr. Email their work to your relatives. Use your platform to make sure their thoughts and perspectives and ideas and analyses reach audiences who might not have had access to them otherwise. It’s strategic and also just intellectually honest (after all, you didn’t just wake up one morning with fully developed racial justice analysis). Looking for some reading lists to start with? Here are some on black feminism, intersectionality, anti-Islamophobia, supporting immigrants, thinking about alternatives to policing and community accountability, and perspectives from queer and trans people of color. 5. Intervene when you see harassment happening. People in dangerous situations probably aren’t safe enough to casually scan their surroundings and take note of who’s wearing a safety pin. If you see someone targeting another person with any version of racist, sexist, anti-Muslim, or anti-queer aggression, quickly evaluate the situation. Aggressors are far more likely to back down if the person intervening is someone they see as equal, so if you’re white, a person shouting racist slurs at someone else would take your “Hey, stop that” far more seriously than a black person’s. It’s unfortunate, but it’s real. Use your voice in these moments. Intervene calmly, with words that help deescalate the situation. Things like “Hey, that’s not cool” work surprisingly well. You can check this guide out for more resources on de-escalation. This works online, too. Sites like Twitter can be hotbeds of harassment for marginalized people. But when white people, especially men, interrupt to tell harassers their behavior is unacceptable, they are far more likely to stop their abuse. 6. If you’re going to engage the country’s ongoing protests, do so responsibly. If you’ve never been to a protest or rally before, it’s easy to get swept up in the energy of the moment. People march, yell, and express their deeply held frustrations. They cry, laugh, and hold one another. Frequently, police show up and situations can escalate quickly. It’s important to be aware of how you navigate these spaces if you choose to go. Are you being loud and disrespectful toward police? That might agitate them — and people of color are the ones who most often bear the brunt of the ensuing violence. However, in situations where police are targeting people of color, place yourself between the parties or make it clear that you are recording the encounter. Because police are less likely to do you harm, this can de-escalate the situation. I’ve seen it happen with my own eyes. Stick to following the cues of those most vulnerable, and don’t try to make the action about you. Are you speaking over the people of color? Are you participating in chants that don’t apply to you, like “I can’t breathe”? These actions can make protests feel actively unsafe for people of color. Remember that you are there to be supportive, and your actions should reflect it. 7. Get involved for the long haul. If you have access to financial resources, give to anti-bigotry organizations that will undoubtedly need to scale up their efforts in the coming months and years. I don’t want to officially endorse charities, but Jezebel published a list of some larger national organizations, and organizers in Los Angeles compiled another list, focused on smaller community-focused groups to consider. Set up recurring donations. Encourage your family and friends with access to wealth to do so too. Consider volunteering with service-based organizations and lending your labor to advocacy groups. Do you have valuable skills, like copywriting or graphic design? Offer to help a local organization with their communications or administrative work; if your skills can be taught to other volunteers, consider offering to host a skill-share workshop so that the knowledge ripples beyond you. Do you have social capital? Ask your highly connected friends and family to consider stepping up in these ways as well. Do you have access to event space? Open it up to organizing groups who need meeting places. Show up and show out for the 2018 midterm elections. Volunteer beforehand to get out the vote in your network and in your area. Report voter intimidation. Get involved and informed at the local level, and help ensure others have access to that knowledge too. 8. Remember to stay vigilant (and patient). Allyship isn’t a static label; it’s a series of actions, an investment. You should be doing this work because you care, because it will help move us all toward a more just world, because it will help save lives. Please don’t expect people of color to continually reward you for caring (remember that emotional labor thing?). Be humble, not defensive, when you are called out. Be patient, compassionate, and kind. We have so much work in the years ahead. But here’s to surviving them together. Charles Kaiser, an author and blogger, used the n-word on CNN on Tuesday while claiming to quote Stephen Bannon, Donald Trump’s senior White House counselor — drawing a sharp rebuke from anchor Brooke Baldwin. “Take a break,” she told her studio team, while shaking her head. If you have opted out of news on Tila Tequila in recent years, you have missed this devolution. But it is not new. And to scroll through Tequila’s timeline — and to look at the depressing detritus of her fall from her fame-ish heights in 2007-8, when she was the prize in MTV’s reality dating series A Shot at Love With Tila Tequila — is to induce insanity. “I am in no way, shape or form a racist nor antisemitic and absolutely not 100% a Nazi supporter,” Tequila wrote in August 2015. Since then, Tequila has retracted that apology in words and in deeds. On Hitler’s birthday this year, she tweeted, “Happy birthday, mein Fuhror!” accompanied by a photoshopped image of her with Hitler and the hashtag #Soulmates, as well as an image of herself with an SS hat, a Nazi armband, and a Hitler mustache. When she isn’t tweeting pro-Nazi declarations, she is praising Donald Trump, fighting with invisible enemies, and bragging about superpowers. If a psychotic break were a Twitter feed, it would be Tequila’s. Before she was a troll, Tila Nguyen — who was born in Singapore to a Vietnamese family and moved to Texas when she was 1 — was the first superstar of the social media age. She was the most popular person on Myspace, with nearly 2 million friends. She used it to launch her music career, but, as Lev Grossman noted in a 2006 Time profile of her, “As for what she does for a living, there isn’t really a word for it yet.” In 2007 and 2008, Tequila, an out bisexual, achieved mainstream fame with Seasons 1 and 2 of A Shot at Love, which featured both men and women as her suitors. From there, things got dark. She dated the NFL all-star Shawne Merriman, but it ended in sordid allegations of physical abuse, which Merriman denied (and the charges were dismissed). She was then engaged to Casey Johnson, the daughter of Jets owner Woody Johnson (of the Johnson & Johnson family). Johnson, who had diabetes, died in 2010 after not taking insulin. Two years later, Tequila overdosed; she had a brain aneurysm, she told Us Weekly, and entered rehab. After that, she gave birth to a daughter, Isabella. Earlier this year, she started a GoFundMe campaign to furnish her new home. The woman who once had more than 1.7 million friends on Myspace, her own television show, and a self-help book has fallen from great heights, and she’s making a living any way she can these days. 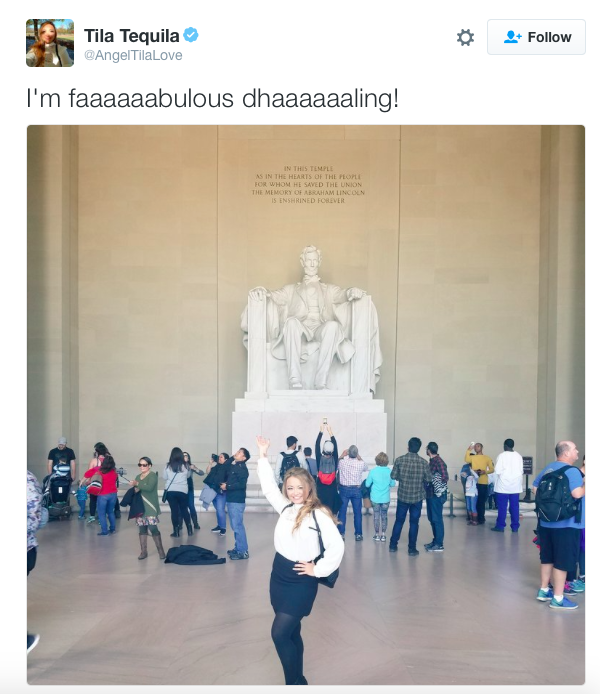 If 2016 has taught us anything, it’s that trolling on social media can take you to the most unexpected places — for one former reality star, that’s a white supremacist conference; for another it’s the White House. Since this story was published, Tila Tequila’s Twitter account has been suspended as part of Twitter’s new anti-hate speech policies. Up until those last three months of the campaign, the top election content from major outlets had easily outpaced that of fake election news on Facebook. Then, as the election drew closer, engagement for fake content on Facebook skyrocketed and surpassed that of the content from major news outlets. A Facebook spokesman told BuzzFeed News that the top stories don’t reflect overall engagement on the platform. He also said that native video, live content, and image posts from major news outlets saw significant engagement on Facebook. Of the 20 top-performing false election stories identified in the analysis, all but three were overtly pro-Donald Trump or anti-Hillary Clinton. Two of the biggest false hits were a story claiming Clinton sold weapons to ISIS and a hoax claiming the pope endorsed Trump. The only viral false stories during the final three months that were arguably against Trump’s interests were a false quote from Mike Pence about Michelle Obama, a false report that Ireland was accepting American “refugees” fleeing Trump, and a hoax claiming RuPaul said he was groped by Trump. This week BuzzFeed News reported that a group of Facebook employees have formed a task force to tackle the issue, with one saying that “fake news ran wild on our platform during the entire campaign season.” The Wall Street Journal also reported that Google would begin barring fake news websites from its AdSense advertising program. Facebook soon followed suit. These developments follow a study by BuzzFeed News that revealed hyperpartisan Facebook pages and their websites were publishing false or misleading content at an alarming rate — and generating significant Facebook engagement in the process. The same was true for the more than 100 US politics websites BuzzFeed News found being run out of the Former Yugoslav Republic of Macedonia. This new analysis of election content found two false election stories from a Macedonian sites that made the top-10 list in terms of Facebook engagement int he final three months. Conservative State published a story that falsely quoted Hillary Clinton as saying, “I would like to see people like Donald Trump run for office; they’re honest and can’t be bought.” The story generated over 481,000 engagements on Facebook. A second false story from a Macedonia site falsely claimed that Clinton was about to be indicted. It received 149,000 engagements on Facebook. The other false viral election stories from hyperpartisan sites came from right-wing publishers, according to the analysis. One example is the remarkably successful, utterly untrustworthy site Ending the Fed. It was responsible for four of the top 10 false election stories identified in the analysis: Pope Francis endorsing Donald Trump, Hilary Clinton selling weapons to ISIS, Hillary Clinton being disqualified from holding federal office, and the FBI director receiving millions from the Clinton Foundation. These four stories racked up a total of roughly 2,953,000 Facebook engagements in the three months leading up to Election Day. Ending the Fed gained notoriety in August when Facebook promoted its story about Megyn Kelly being fired by Fox News as a top trending item. The strong engagement the site has seen on Facebook may help explain how one of its stories was featured in the Trending box. 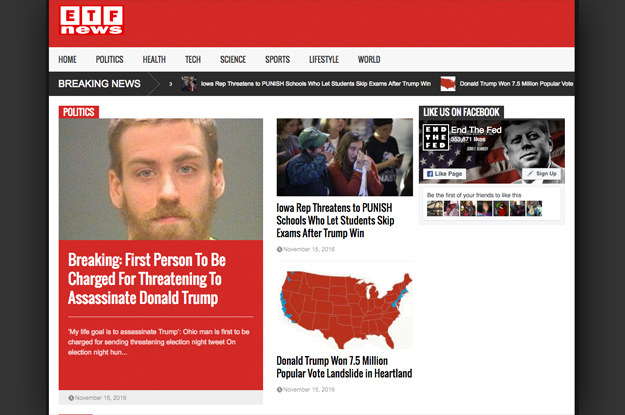 The site, which does not publicly list an owner or editor, did not respond to a request for comment from BuzzFeed News. Like several other hyperpartisan right-wing sites that scored big Facebook hits this election season, Ending the Fed is a relatively new website. The domain endingthefed.com was only registered in in March. Yet according to BuzzFeed News’ analysis, its top election content received more Facebook engagement than stories from the Washington Post and New York Times. For example, the top four election stories from the Post generated roughly 2,774,000 Facebook engagements — nearly 180,000 fewer than Ending the Fed’s top four false posts. 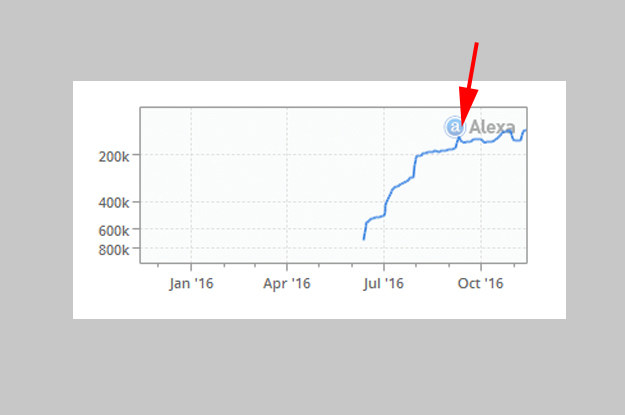 Alexa estimates that nearly 30% of Conservative State’s traffic comes from Facebook, with 10% coming from Google. That site was only registered in April of this year. Its publisher disputes the idea that its content is aimed at misleading readers. “The BS Journal is a satire news publication and makes absolutely no secret of that or any attempt to purposely mislead our readers,” he told BuzzFeed News. Large news sites also generated strong Facebook engagement for links to their election stories. But to truly find the biggest election hits from these 19 major sites, it’s necessary to go back to early 2016. The three biggest election hits for these outlets came back in February, led by a contributor post on the Huffington Post’s blog about Donald Trump that received 2,200,000 engagements on Facebook. The top-performing election news story on Facebook for the 19 outlets analyzed was also published that month by CBS News. It generated an impressive 1.7 million shares, engagements, and comments on Facebook. Overall, a significant number of the top-performing posts on Facebook from major outlets were opinion pieces, rather than news stories. 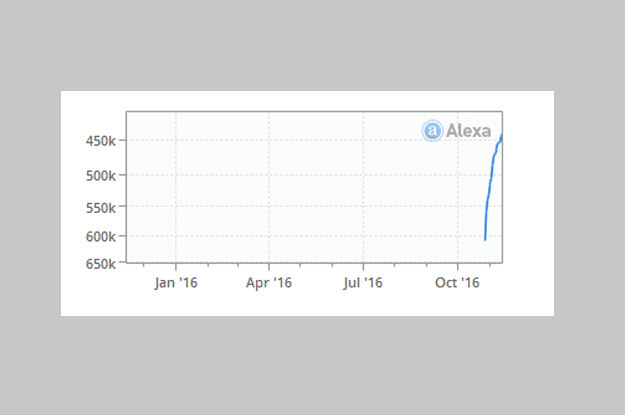 The biggest mainstream hit in the three months prior to the election came from the Washington Post and had 876,000 engagements. Yet somehow Ending the Fed — a site launched just months earlier with no history on Facebook and likely a very small group of people running it — managed to get more engagement for a false storyduring that same period. In addition, created lists of the URLs of known fake news websites, of hyperpartisan sites on the right and on the left, and of the more than 100 pro-Trump sites run from Macedonia that were previously identified in BuzzFeed News reporting. We then looked for the top performing content on Facebook across all of these sites to find false stories about the election. 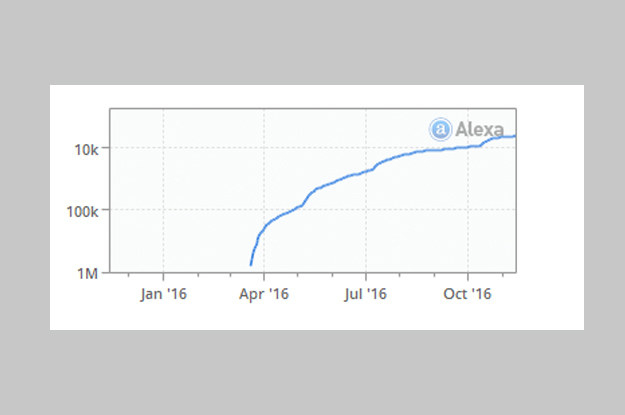 We conducted our searches in three-month segments beginning 9 months from election day. This broke down as February to April, May to July, and August to election day. Even with the above approaches, it’s entirely possible that we missed other big hits from fake news websites and hyperpartisan blogs. To examine the performance of election content from mainstream sites, we created a list that included the websites of the New York Times, Washington Post, NBC News, USA Today, Politico, CNN, Wall Street Journal, CBS News, ABC News, New York Daily News, New York Post, BuzzFeed, Los Angeles Times, NPR, The Guardian, Vox, Business Insider, Huffington Post, and Fox News. We then searched for their top-performing election content in the same three-month segments as above. Read more : WILL HE BE OUSTED? Internationally acclaimed author and celebrated feminist Chimamanda Ngozi Adichie had a smart response to a man who claimed President-elect Donald Trump had not been racist throughout his campaign. The exchange was part of a larger discussion between the Nigerian novelist and R. Emmett Tyrrell, editor-in-chief of the conservative magazine American Spectator, on BBC Newsnight, which aired Friday. BBC reporter Emily Maitlis pointed out that Republicans like Paul Ryan had previously acknowledged that Trump has been racist in the language he’s used. Tyrrell claimed that Adichie’s argument, which he called false consciousness, was a Marxist concept. “In other words, I can’t even open my mouth here because I’m a white male,” he said. She used the example of Trump saying in June that a federal judge’s “Mexican heritage” would mean he couldn’t impartially preside over a case involving Trump. “I looked at Judge Curiel, and he didn’t look any other color than my color,” Tyrrell said. People are really freaking keen for Michelle Obama to run for president in 2020. Some have made some pretty confident prophecies. Some are keen to change their lifestyles just so she will run. Others are even keen to start campaigning for her ASAP.